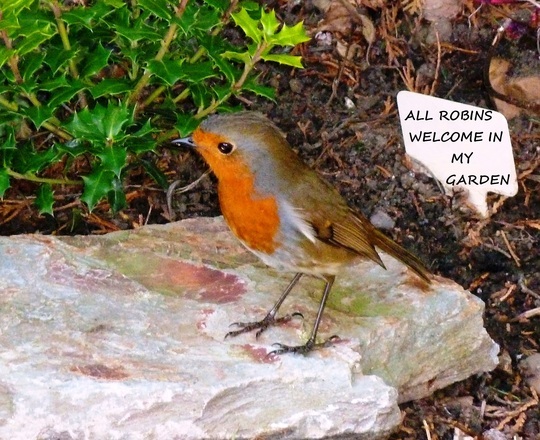 thats lovely and what a clever robin being able to read as well!! I to had Mr Robin beside me all day thur and yesterday singing away it was lovely TT. He didn't look for real at first. Great capture. Lovely photo like your welcome sign too. Isn't it funny how we all adore a little Robin Red Breast, even though he is an absolute thug and a terroriser of all the other birds. So cute though, I love them too, always happy to see them in my garden. The robin posed nicely for me, making it easier to take the pic. I've never before had the opportunity to photograph a robin close up, so I was thrilled when this perky little bird perched on one of my rocks. The little garden birds are a delight, aren't they. Lovely pic. I haven't seen a robin all Summer but this last week we've had a regular customer eating the mealworms. It's lovely to see them. *s* with what looks like holly in the background, there's the design for your Christmas cards! I do like the rock he's standing on; what kind is it, do you know? the colour differences are striking. lol normally, within two days of the snow clearing away, someone round here is bound to complain about the heat! Of course, too much of anything isn't necessarily good for one, but I can take a lot of the current weather. Maybe you or a friend could tweak the photo for a "seasonal" feel? They have started to sing for their territories around here and first thing in the morning sounds lovely. About seven I opened the curtains to see a large flock of geese flying low calling to each other flying over our bungalow....super! A really stunning shot Terra - he looks very young too. Hasnt got a middle aged spread yet lol! tell you what, Terratoonie, if you could make this picture into a small wall poster, you'd have at least one person queueing up to buy a copy! Of course, there'd be quite a few other photos on GoY that I'd like to have on my wall, but this has to be close to the very top of the list. lol, a new section in GoY? Poster-shop? What a lovely picture Terra , robins are one of my favourite birds. He`s a little beauty Terra, looks as if he has just had his breast painted.lol. Thanks Stroller and Grandmage .. He's a beauty TT, yes a favourite of mine so have sent him to my favourites. The little notice is a great touch. That's good news... my robin has been around... keeps posing really nicely when I haven't got my camera handy...Lol. Wonderful sunny, autumn days digging over the moist soil, with the liquid golden song of a robin from the nearby tree. For me, 100% total contentment. I think he has the best song of any bird, nightingale included. I can hardly believe this. When I wrote my last comment, I was thinking back to days in our UK garden more than 6 years ago now. We rarely see robins here - mostly due to the cats, I expect, and the fact that this is agricultural land round here with few gardens. It made me terribly nostalgic. Yesterday afternoon - a gorgeous, woodsmokey, golden day, I was digging over the rockery where I have been tearing out vinca roots, and I thought I was hearing things: a robin's song - liquid gold. I couldn't see him for some time, and then, there he was, high in the cherry tree. We stood still for some minutes, then down he came and continued to sing for a full five minutes maybe two yards away from me. Eventually I had to leave, I was crying so much. Coincidence? Do robins read blogs? My robin keeps returning... and seems to like to pose for my camera..Lol..
glad you are getting visits from garden birds ..
How did I manage to miss this one! What a smashing little Robin you have there Terra - lovely pose - lovely photo. what kind of rock is that? I love the colors in it...I want to buy your rock! Never saw anything like it. ... as with you, I was amazed by the colours and decided to buy it ! Wish I could email you one of these rocks.. Lol. I'm sure it is from somewhere in England ..
What Great Photo.and so Close To You.